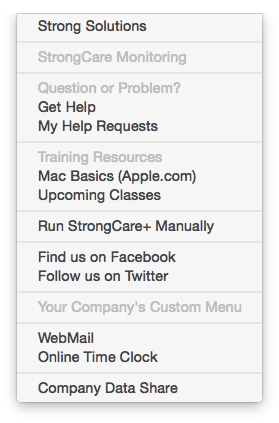 StrongCare+ is a proactive service that includes monitoring, routine maintenance, updates to most software, and operating system updates. One way we support your Mac is by regularly doing maintenance on it. Some of these tasks run in behind the scenes while your computer is idle. Some however we cannot do while you are logged in for fear we would interrupt you or lose unsaved work. We only run those when your computer is logged out. 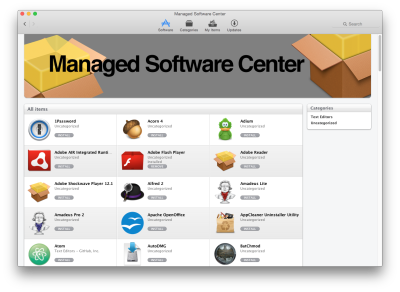 Software updates are managed for you. We will prompt you with updates to many of the popular software packages out there. We are flexible on software updates. You want the latest and greatest? We maintain a “Living on the Edge” software update set. Prefer to be more cautious? Our “Safe & Sane” software update set is fully tested before being pushed to your machine. We are also able to distribute your software and licenses with an optional Local Staging Server. Allowing employees to load their own software without administrator intervention. StrongCare+ performs maintenance around your schedule. We seek the optimum time to execute behind the scenes without interrupting your work. If we can’t get it done, we issue gentle reminders to ask you to log out. When would I log out? If you leave your computer at work, log out at the end of the day when you go home. If you use a laptop, log out (and leave the lid open) when you can – perhaps before going out for lunch, or before you go to bed. Choose Log Out from the Apple menu. It will ask for confirmation, and then proceed to quit all of your programs. What about my open documents? Won’t I lose work? No. When you log out, applications will ask you to save anything that is left open and unsaved. If you click Cancel, the log out process is stopped. How often should I log out? We try to run maintenance every day but it’s OK if you can’t log out everyday. We get an alert if maintenance has not run in two weeks and will likely call you to see if everything is OK.
Our software can detect a certain type of disk failure that, if left unchecked can make your computer unusable. When that happens we ask you to let us run the repair routine ASAP. What if I log off and nothing happens? It was probably too soon to run maintenance again. We don’t run it at every logout – at most once per day. What if I log off but it’s taking too long? For most of the process there is a cancel button at the lower left. Click it anytime to make the program stop. Your work is way more important so don’t hesitate to make it stop. There is one process that you cannot cancel but the Cancel button will reappear when it is done. Can I just shut it off? Yes but this is a fundamental part of the proactive service you expect from us. We would prefer to talk about what we can change to make the maintenance fit your specific requirements. Please give us a call! We strongly believe that our unique approach will both improve the reliability of your Mac and stay out of way when you need to get work done. Thank you for letting us be part of your success!